After I had seen The Bucket List, I have been talking to people about it and my own bucket list which is a work in progress. Since my father died last year however, I have been able to score off a number of items on my list as I have been able to travel freely and even within Pune have enough freedom to do many things that I was not able to due to my care-giving duties. A series of developments starting with an innocuous question from Ranjan this morning took me visiting family albums today and I went on a nostalgia trip thanks to the modern internet that has enabled my siblings and other family members to upload photographs that can be easily accessed. The first photograph here shows me in the middle, my younger brother Arvind to my right and the youngest Barath to my left. This would have been circa 1949 just before or just as our youngest sibling Padmini was born in Madras now known as Chennai. The car at the back is a 4 Cylinder English Citroen Traction Avant. My late father and his younger brother had a particular fondness for these cars and had many, including a couple or so of the six cylinder version with steering wheel on the left side, pass through their hands in the early 1940s and 1950s before they switched over to big American cars. I distinctly remember going to see Padmini after she was born in a nursing home in this Citroen. A fact that was driven home to me by my uncle in 1971 when I had gone to Madras to attend Padmini’s wedding and was using a friend’s car which was exactly the same model as this one on the picture. My friend, an automobile engineer had kept this old beauty in top class condition and it was a pleasure for me to drive it around with Urmeela and Ranjan who was then a tiny three month old boy. Needless to say, that the Citroen and Ranjan were the topics most discussed by me with all attending the wedding. 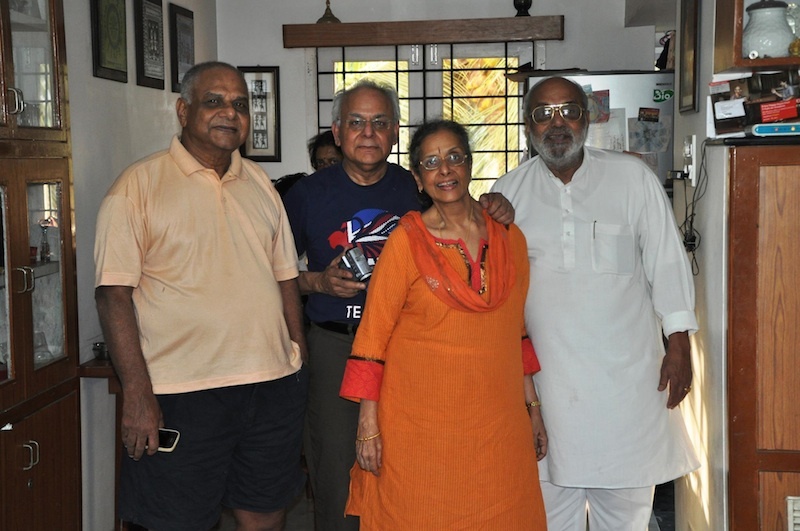 Fast-forward to February 2013, a lot of water has flown down the Cooum since then but the four of us met up in Madras when Barath had come down. This time, the youngest and the apple of all our eyes, Padmini was with us for a group photograph. From left Arvind, Barath, Padmini and yours truly, all four of us looking quite pleased with ourselves for the way we have turned out. This time around the topic of conversation was the latest grand child in the family. Barath’s grandson Finlay George who was sorely missed by all of us as two sets of grandchildren were at that time in Chennai; Padmini’s two grand daughters and Arvind’s two grand sons. Earlier towards the end of last year I had gone over to Delhi to meet up with Arvind’s grand son and grand daughter who live there, and two grand sons who live in Bengaluru. My son Ranjan and his partner Manjiri saw The Bucket List last night and this morning came and asked me what is the top most on my bucket list. I did not have to take even a second to respond. It is to go over to the UK and spend some time with Finlay George. To score that item off my list, two other items have to be scored off before and that is the only thing that is preventing me from achieving that end. It is a matter of time, but they will be scored off and I will take off to meet up with this delightful little fellow who is the youngest Rajgopaul now. It should be a grand moment when the eldest and the youngest lay eyes on each other. 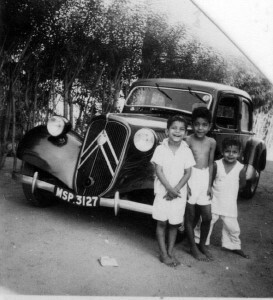 This entry was posted in Family, Nostalgia, Relationships and tagged Bengaluru, Citroen, Cooum, Madras/Chennai. Bookmark the permalink. 30 Responses to Bucket List. My first reaction to this intriguing piece was to think “Ramana , you are too young to make a bucket list !” But then I thought we never know what’s round the corner so might as well make one , fatalistic as that might seem & sound. I have been going through a mental list ( not a formal one ) and ticking off a few practical ( like making & registering a Will and generally “putting things in order ” ! ) as well as aspirational ones ( mostly travel & meeting people ) – not really things I would like to do before…( I “kick the bucket” ) …..but more things I would like to do , at the earliest ( I suppose most people do this , except those that live for today , which too is not a bad thing ) . Perhaps I should include some frivolous/quirky ones like riding a bike , going on a Giant Wheel , eating cotton candy and yes cleaning out my desk ! On the other hand that would take the “spontaneity” out of it and maybe a little of the joy of “Just Doing It” ! One just wonders if one is on someone else’s “bucket list” ! Oh ! I forgot , my Dad ( when I was about 8 or so in 1956) owned a Woolsley – Maroon/deep-red & Black beauty – funnily the few things I remember about it are , the smell of leather , the running board and the illuminated indicators on the side between the 2 doors – used to gape at them in awe and curiosity when they leaped out as if by magic when our rather portly chauffeur Thomas did something ! He sold the car to his friend when we moved and the last I saw of it was around 1962/3 , still in immaculate condition . Funny the things one remembers , though often memory plays tricks , apart from the fcat that almost everything looks much smaller than what one remembers them as a child – school buildings , teachers , even ice creams ! Oh, yes those illuminated turn indicators that would pop out of the middle pillar. Fascinating little things. If you see that Citroen carefully, you will see that its windscreen is partially open from the bottom. This was an innovation for the Indian market! Nandu, you would not have been the first one to say that to me nor the last. You must however remember that since the year 1999 till late last year, ie about 11 years, I dropped out of life to attend to more pressing needs. Since after that vanvaas I am breathing more freely and trying to structure my life so that I can pop off without any regrets for not having done something. Good luck with all of that . Make it a point to meet me again and in BLR , even if it is not in your bucket list ! My informal “bucket list” , rather mental note list , included meeting you in Pune which I did ! You are not a bucket list detail. You are a must see item number. Make sure you get there for bath time! That is not all Grannymar, that lad will be spoilt silly doing things that he did not know kids can do with grand uncles. wow. rummy. what a beautiful and handsome family. and you’re all alive and well! plus ! I do love yours and padmini’s traditional clothes. so cool! The inside story about why we wear Indian attire is that we do not have to worry about them getting too small or big for us as we keep putting on or taking off weight like yoyos. This is such a nice post, Ramana! Great memories, great people and a new little squirt to carry on the ornery. The Old Fossil recently posted..Out of sight, out of mind! That little squirt is one of the three Rajgopaul squirts to carry the name forward Conrad. Two others are in Chennai and are absolute rowdies. 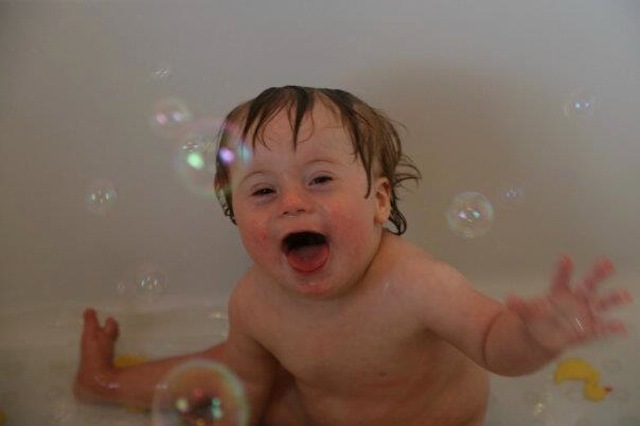 The baby playing with bubbles made me laugh. Too cute. Hope you make the trip. Ganesha willing, I will Maxi. Thank you. That’s a good aspiration for your bucket list. As for mine, I’ve been wanting to see San Francisco for about 40 years, and we’ll finally be going there in the autumn! Nick recently posted..Crisis, what crisis? Congratulations Nick. Have a great time. Your father disincarnated last year? My sympathies. The Bucket List is a great movie, I loved it. Awe, you and your brothers were so cute! Barath had a lot of style, look at that pose. The three of you look lovely in this photo, you really do. Padmini is a beautiful woman too. Rummy, you have a gorgeous family! Arvind seems responsible (in a group of siblings there is always that one who looks the most responsible of all, know what I mean?). Finlay George is a good looking little chap with a beautiful smile. He is quite happy, isn’t he? Rummy, you are a beautiful human being blessed with a gorgeous family. Rejoice with me for my father’s disincarnation Max. Arvind is indeed a very responsible fellow but do not let looks of the others fool you. Thank you for that big hug. I heartily reciprocate. Cathy in NZ recently posted..Back to Earth! You have lots of fun and do share it all with us too. I always see you commenting on Mitch Mitchell’s blog so I thought I would drop by and see what you’re writing about. My husband and I saw the bucket list and it got us talking about what kinds of things we wanted to do before we died. Mine is to take a return trip to St. Lucia—my idea of Heaven on earth. I hope you accomplish your next bucket list wish in the very near future. Thanks Beverly. I appreciate your visit and your good wishes. I hope that you get to tick off more than just the visit to St. Lucia by making more entries on your bucket list. You have a nice blog but why have you not provided for comments? Soon milad, soon I hope. Good to see some more of your photos, Rummy. I’ve not seen the film, but as for bucket lists – I don’t care for them. Why make a list of things to achieve before dying? Why not just get on with living?